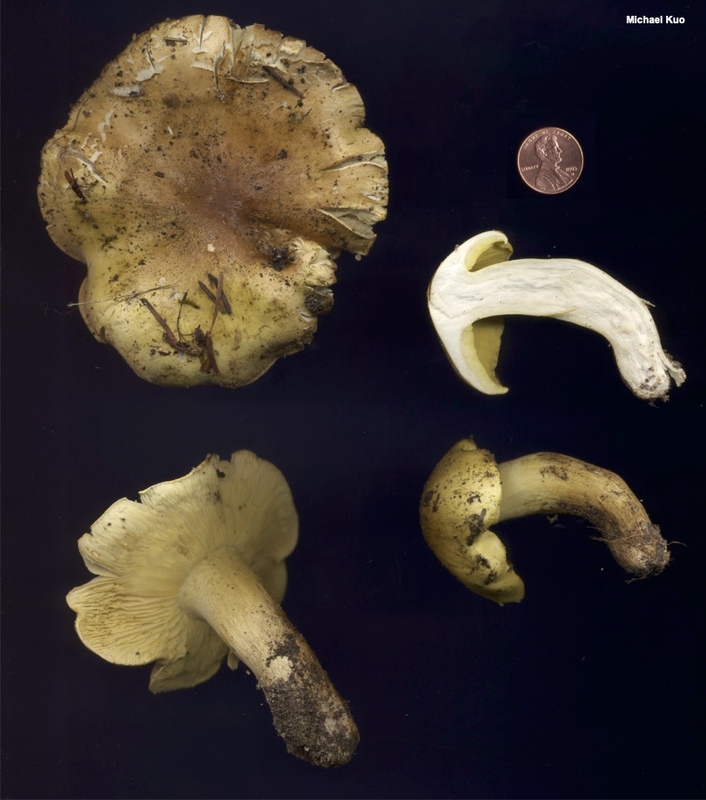 Tricholoma equestre can be recognized through a combination of features. 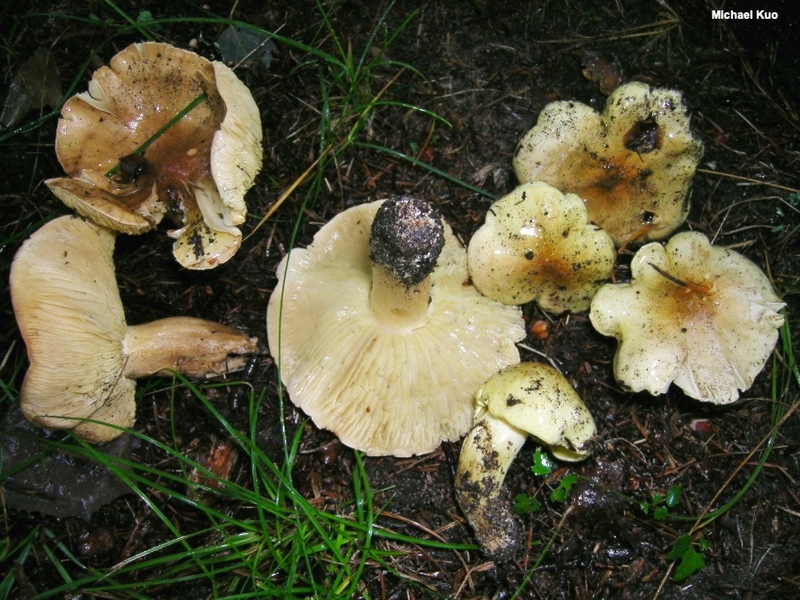 It has the white spore print, notched gills, medium stature, and other features that define the genus Tricholoma; it lacks a partial veil, which means there is no ring on the stem; it grows under pines in poor, sandy soil; it has a yellow cap that becomes brownish with age and lacks blackish appressed fibrils; its odor and taste are mealy; and, finally, its gills are yellow. By current definitions Tricholoma equestre occurs in Europe and North America—and, within North America, in incredibly diverse ecosystems. However, according to Christensen & Heilmann-Clausen (2013), "[a] complete assessment of T. equestre and allied species, based on a global sampling strategy, and combining molecular and morphological methods, is strongly needed" since there is, according to Heilmann-Clausen and collaborators (2017), "considerable cryptic diversity" in the group. Tricholoma flavovirens is a synonym. Ecology: Mycorrhizal with pines; growing alone, scattered, or gregariously in poor, sandy soil; summer and fall; widely distributed in North America as a species group. The illustrated and described collection is from Michigan. Cap: 5–10 cm across; convex becoming broadly convex; sticky when fresh, but soon dry; bright greenish yellow when young and fresh, but soon developing a brown center that expands nearly to the margin with age; bald or with a few appressed fibers over the center (but not prominently overlaid with blackish radiating fibers). Gills: Attached to the stem by means of a notch; close; short-gills frequent; pale to bright yellow. 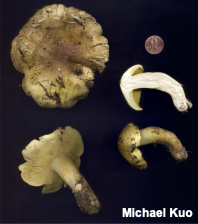 Stem: 5–7 cm long; 1.5–2.5 cm thick; more or less equal, or with an enlarged base; bald or finely hairy to subscaly; pale yellow or whitish near the apex, more yellow below; basal mycelium white. 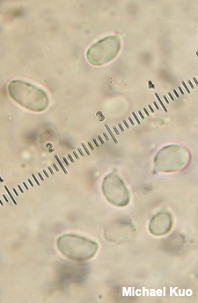 Microscopic Features: Spores 5–7 x 3–4 µm; ellipsoid; smooth; hyaline in KOH; inamyloid. Basidia 4-sterigmate. Lamellar trama parallel. Hymenial cystidia not found. Pileipellis an ixocutis; elements about 2.5 µm wide, smooth, hyaline to reddish in KOH. Clamp connections not found. REFERENCES: (Linnaeus, 1753) Kummer, 1871. (Quélet, 1886; Saccardo, 1887; Kauffman, 1918; Smith, Smith & Weber, 1979; Ovrebo, 1980; Weber & Smith, 1985; Arora, 1986; Breitenbach & Kränzlin, 1991; Phillips, 1991/2005; Lincoff, 1992; Shanks, 1996; Barron, 1999; Roody, 2003; Deng & Yao, 2005; McNeil, 2006; Miller & Miller, 2006; Trudell & Ammirati, 2009; Kuo & Methven, 2010; Bessette et al., 2013; Christensen & Heilmann-Clausen, 2013; Kuo & Methven, 2014; Desjardin, Wood & Stevens, 2015; Evenson, 2015; Siegel & Schwarz, 2016; Cripps, Evenson & Kuo, 2016; Baroni, 2017; Heilmann-Clausen et al., 2017; Elliott & Stephenson, 2018.) Herb. Kuo 09140804.